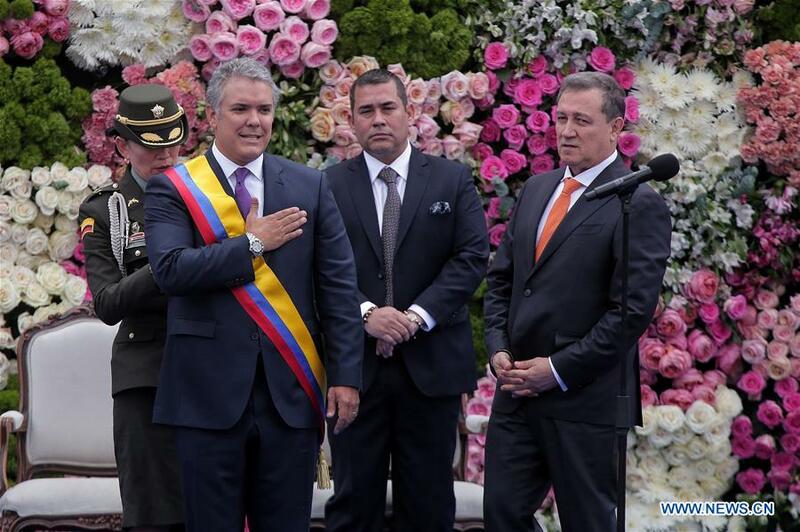 Colombia's president-elect Ivan Duque was sworn in on Tuesday, succeeding Juan Manuel Santos as the country's 60th president. In his first speech as president, the 42-year-old Duque, of the conservative Democratic Center Party, said his government will assess the unfinished peace process that the Santos administration began with the country's second-largest guerrilla group, the National Liberation Army (ELN). "In the first 30 days ... we are going to carry out a responsible, prudent and thorough evaluation of the negotiation process that has taken place with the ELN over the past 17 months," said Duque. He also pledged to bolster the country's security forces. As for the economy, Duque said he plans to launch "an economic reactivation program" to spur investment and competition. "Colombia must be a country where micro, small, medium and large companies can make sustainable progress to generate quality jobs," he said. "I will implement all the structural reforms needed to ensure the nation's fiscal sustainability" with an eye to achieving economic growth of "more than four percent," said Duque. His vice president, Marta Lucia Ramirez, became the first woman in the country to fill that role. According to the Caracol News Agency, delegations from some 17 countries attended the ceremony in the capital's historic Bolivar Square.